Sometimes it's worth it to visit the Auction House and check the prices of items that can be converted into something else, like many enchanting materials. Especially if you are feeling lazy, as this involves no farming at all. Just a ton of clicking! Time to play the Auction House! 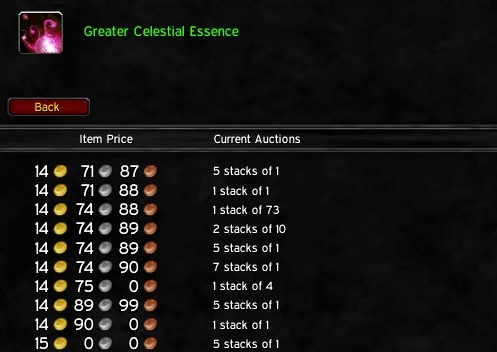 Today's valuable item is Celestial Essences from Cataclysm greenies! 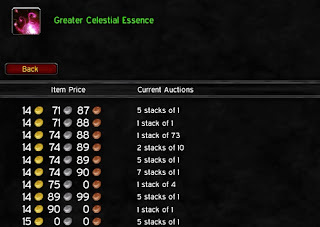 Usually always there's gold to be made when purchasing lesser essences and converting them into Greater Celestial Essences, or in some cases the other way around, which can be exploited to make a ton of extra gold. Especially if the price differences are massive! Lesser Celestial Essences starting just from 8 silver. You need 3 to create a Greater Celestial Essence. go for 24 silver? Not quite! Now all realms have different prices for essences, but in this case if I were to purchase all 500+ Lesser Essences for 8 ish silver, it would cost little over 40 gold and turn into over 170 greater essences, which at the current prices would be worth over 2400 gold. It's good to keep in mind that it always takes longer to sell old enchanting materials and you can easily get undercut. But the profit is very much there if you can keep the prices high for a long time! 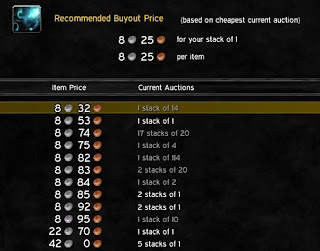 If you do find a ton of items to re-sell, always remember to post them in small stacks, and don't overdo it. In this case it's enough to list 50 Greater Essences at a time, preferably in stacks of 5-10. And if you log in often, set the time to 12 hours always. Otherwise you can keep a 48 hour setting, as enchanting materials don't have noticeable listing fees. Good luck! If this gets many views, I will post more auction house tips. Otherwise it's back to farming!